The Toronto Jewish Film Festival features a total of 26 Canadian premieres this year. One of the most highly anticipated among them is The Samuel Project. 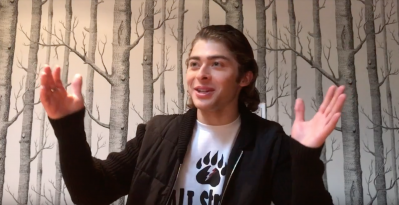 Ryan Ochoa, previously known for his roles in Nickelodeon’s iCarly and Disney XD’s Pair of Kings, stars alongside the legendary Hal Linden. We had the chance to chat with him during his stay for the Festival. TWPR: Can you tell us about your new film, The Samuel Project? RO: I’m in a new film, a Toronto Jewish Film Festival selection film, called The Samuel Project, and it’s about a high school student named Eli. He ends up building a relationship with his grandfather after he makes him the core subject of his animated art project for school. TWPR: What drew you to become a part of this project? RO: A little bit of everything, and I know that sounds cliché! I’m not trying to sound cliché! It started with the story. The story is just solid. Sometimes art or unspoken words can be more powerful than anything, than actually communicating [directly]. That’s ultimately what the movie’s about – lack of communication – between three generations, and my character, Eli, who ends up making this project and bringing all of the generations together. I don’t want to give anything away, but it’s not like you see the project and then everyone lives happily ever after. It’s a realization that we could be better. We can all be better at just communicating. Nowadays it’s all about this [he mimes texting on his phone]. Not saying that I’m not! Social media’s so important now. I love it, it’s my favourite, but you do have to have another side where you’re able to have a normal conversation with your family. Me being a family guy, that’s why it was important for me to do this movie. TWPR: What was it like working with him? TWPR: You mentioned that you love social media earlier. You have such a dedicated and interactive fan base online. How do you manage to keep so well engaged with them? RO: I do have some help! I brought along my brother, Bobby [he gestures across the room]. It’s a team! Me and my brothers really help each other. Our dad is also very involved in helping us. All of us grow and work together. My Ryan-ators and our Ochoa-nizers come first. I want them to feel like they’re on the journey with me. We inspire each other. So many of our fans send me inspirational messages and things about their lives, about what they’re doing, and it inspires me to be better and work harder. That’s why if I’m doing something, I need to share my experiences with them. Anywhere I go, it’s a responsibility for me. I want to make sure that before I’m leaving my hotel, I’m like, “hey guys, this is what’s going on, I want you guys to be there, check this out”. We’re a family and I’m starting to really show that it’s not just temporary. I’m serious about inspiring every person that I can. But it does take a village and it’s a lot of hard work. I’ve posted three times yesterday and my brother made a joke. He’s like, “three posts? That’s like normally two months of work for you”. I don’t really post too often because life gets crazy and I write these huge captions. But out here in Toronto, it’s Team No-Sleep! TWPR: You’ve been in Toronto for a little while now. Have you had the chance to explore? What are you first impressions of us? TWPR: Do have have anything you want to say to all of your Canadian fans out there? RO: Oh absolutely. I do have a special message I want to say to all my Canadian Ryan-ators and Ochoa-nizers and around the world. I know I always say that I will always want to meet more of you! This is an example! I’m here in Canada right now and I promise that I’ll keep working hard so I cant meet more of you. Canada is just one step to the next! So, thank you for waiting! One of our biggest Ochoa-nizers, she was my very first supporter from the very beginning, she’s actually coming to the screening tomorrow. It’s been five years since I met her. Now it’s been almost three years, and I’m back now. Just like I told her in the beginning, I will meet you guys! Just give me some time! Thank you for supporting me and being so dedicated to the journey. I appreciate every single one of you. Ryan Ochoa stars alongside Hal Linden in The Samuel Project, playing this week at the Toronto Jewish Film Festival. May 4 @ 1:15PM, Cineplex Yonge and Eglinton and May 6 @ 2PM, Cineplex Empress Walk.